So SOAP Web Services is a pretty mature technology now, and performing cross-language service calls should be a breeze, right? In utopia, yes - unfortunately we live in the real world. I did finally make it work but it took me a day and a half, so I thought I'd share my experience here. There are other guides on the net that focuse on NuSOAP, like this one on Sanity Free Coding, but I prefer to use the stock SOAP library in PHP5 so that's the focus for this guide. The server: WSDL or non-WSDL-mode? As of now, the PHP5 SOAP extension does not support auto-generating WSDL as the .Net Framework does. But it does support a non-WSDL mode. That creates an issue though, because Visual Studio relies on WSDL files in order to create the client reference as illustrated below. To make a long story short, I never got non-WSDL mode to work with .NET although I got pretty close, but then I relied on a dummy WSDL on the development computer just to fool Visual Studio into creating the proper service reference. So I needed the WSDL anyway. This I implemented in my dummy web service project. I have not implemented the business logic in the body - I only do as much as I need in order for the service to compile. I then get the WSDL by launching the app and adding ?WSDL to the URL. In my case, this became http://localhost:7048/SomeService.asmx?WSDL. Save this file for later use at the PHP server. Now over to the client. I'm creating a simple Windows Forms app which takes an input, allows the user to trigger the web service call and displays the output. See screenshot below. 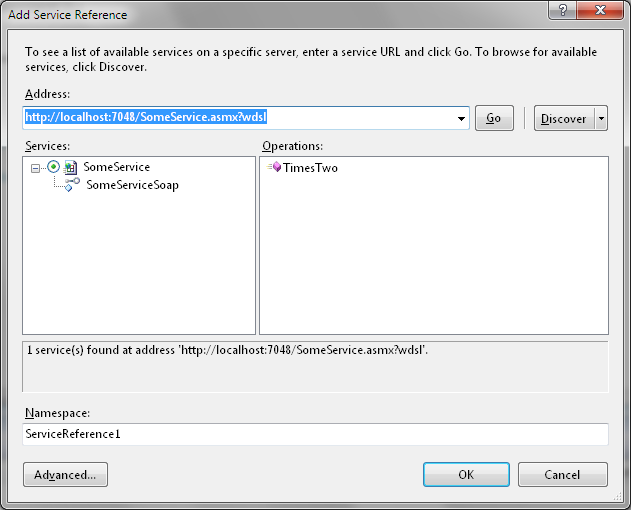 Add a service reference to the solution by pointing to the local dummy project. It would be a good idea to also test the client in this phase and see that the dummy server returns the value zero. The client is really the easy part, so I'm moving over to the juice. Now the tricky part was understanding how .NET wrapped the input data and how it expected the return data to be wrapped. Some Googling lead me to the answer on the return value. A bit of trial and error and with aid of the serialize() function, I figured out the input data. Note that the string literal ("TimesTwoResult") on the return line needs to to match the result specification in the WSDL. 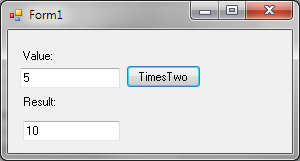 Similar, the "value" property in the input object is the name of the first input parameter. Now that's all there is to it! How can i fetch all elements? for example 10 items? Sorry for late answer. How is your PHP code implemented? Are you saying you are returning an array of String's? If so, try changing the method signatur in C# to "String" or "List<String<"
Great. I also read about best virtual data rooms and it also is very imortant! I don’t waste my free time in watching movies except I go for to read posts on net and get updated from newest technologies. Ukraine is one of the best outsourcing locations for softwrae development, and Java is one of its core technologies. I believe this article will provide you with valuable insights and help you to find hire blockchain developers .